"I would refer to a quote that we found by Nikola Tesla in which he describes his feelings about the world, and what he says is that we are all connected like stars in the firmament with forces unseen. And even though we can't see these forces, we can feel them. And that's something that we find is a very good description of music." That's violist Edwin Kaplan explaining why the Tesla Quartet is named after the physicist known for discovering alternating current. A scientist who really wanted to connect people and better their lives. 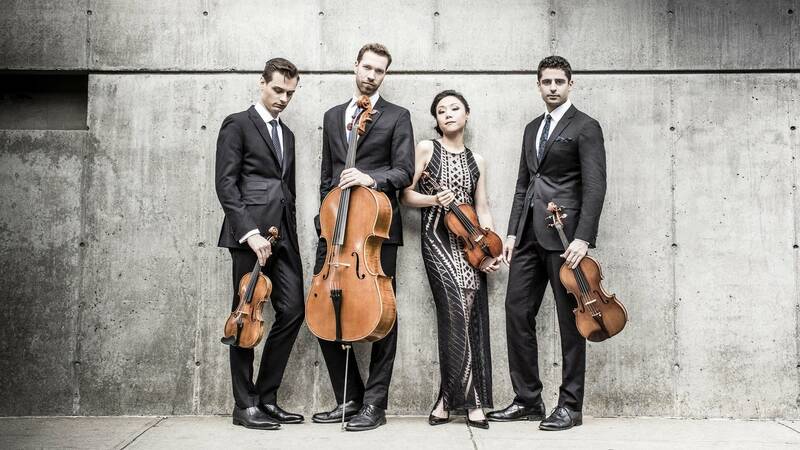 After a decade of bringing people together and enriching their lives, the Tesla Quartet, which also features violinists Ross Snyder and Michelle Lie, as well as cellist Serafim Smigelskiy, has just released their first recording. You're celebrating your 10th anniversary as a quartet, and you're releasing your first recording — this is your debut recording. Why has it been 10 years since the Tesla Quartet finally decided to put out their first recording? "This is Serafim. And we've just been working on establishing that sound, you know, that moment where we know, 'Okay, we got this.' This is just this amazing Tesla Quartet signature sound. And we also were able to play enough with each other to learn about our favorite pieces of music to play. And this CD, in fact, is a perfect example, a perfect reflection, of what we love to play the most. "It starts with Haydn, who is the creator or the inventor of string quartet. Then we jump to Ravel, which is just one of the greatest pieces of the 20th century and also one of the most profound works for string quartet. "And then Stravinsky is this crazy piece that, for people who might not be as familiar with the wide range of string quartet repertoire, might consider, 'Wow, is that a string quartet?' That's just crazy that it could produce this kind of range of sound. And of course, we have last, but not least, our own Ross Snyder who did a wonderful arrangement that is also unique to our quartet. We don't just limit ourselves with what has already been written for a string quartet, but we like expanding our horizons to the new sounds of a string quartet." Serafim, you mentioned that it's taken you a little time to find your signature sound. How do you describe that signature sound? What is it that sets you apart from other string quartets? "I just had this conversation with a person who happens to be a world champion gymnast, and he compared our sound to this idea of beauty in sonority. You know, he said that — how we four just make up this combination of our individual sounds that is so much more than the sum of the sounds — and he was comparing us to the synchronized swim or synchronized acrobatic groups that are making a work, a visual representation of a particular gesture, that you stop noticing individual members and all you see is the art of this unity. And it's one of the most satisfying and gratifying things about playing the string quartet. And I think we achieved that." "This is Ross. One unifying aspect that I think we all latch onto that helps keep us connected is that I think we have a strong concept of the linguistic and speaking elements in the music, and so often we're approaching the way we want to play a phrase as if we were trying to actually speak words. And how do you communicate with your words and the tone of your voice the idea you're trying to express, and so I think that that is something about our group that we kind of feel at the center of our interpretation, how music can be a language." Michelle, I'm wondering if you might talk a little bit about the Haydn string quartet that you chose to include on this recording, because I know it's a particular favorite with the Tesla Quartet and I'm curious why. "The middle movement of that particular quartet has a very unique character to it. It has this first violin — Ross plays really beautifully on it — kind of like a making it up on the spot kind of quality. A spontaneous beauty, I guess." "This is Edwin speaking. The last movement, you would expect like a big finish, bombastic finish, you know Haydn is great at providing that energy. He's also very clever at subverting your expectations, and so when the last movement begins, it's this incredibly slow, beautiful, processional music, and there's a little nugget of a surprise in the last movement, but I don't want to give it all away. I want people to experience the uniqueness of this quartet and allow them to be surprised by all the twists and turns."